ANZAC DAY SERVICE Friday 22nd April 2016 The theme for this years service focused on the important role played by Australian military medical & nursing services. The paradox of war is that armies whilst trying to kill each other have their medical staff at work in the fields relieving pain, combating diseases, healing wounds & reconstructing damaged bodies & minds for both sides. 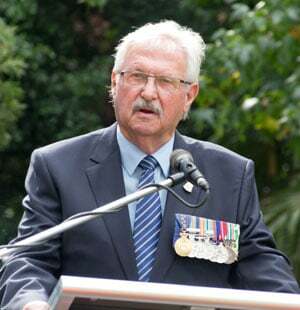 The Anzac Requiem was presented by former NSW Governor Hon. Dame Marie Bashir, who being a medical professor, stressed the benefits of professional military services. As usual MC John Gatfield directed the service with dignity & aplomb. 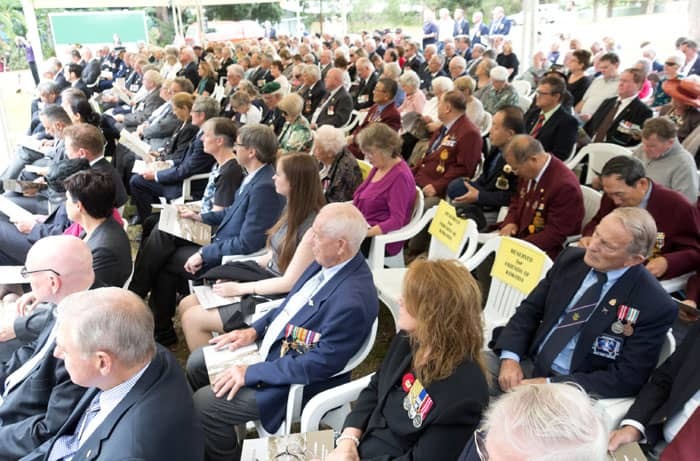 Firstly introducing Walkway Chair John Haines who welcomed guests; Concord General Manager Dr. Tim Sinclair who read a scripture passage; RSL National President Rear Admiral Ken Doolan RAN (retd) who delivered the ode; Chaplains Rev Paul Weaver & Fr. Graeme Malone, who delivered prayers; NSW Corrective Services Band with their musical & song arrangements. Mayor Angelo Tsirekas thanked those already mentioned along with diplomats Scott Strain, Consul Gt Britain; Kristine Knapp & husband C.G. USA; Sumasy Singin C.G . PNG; Mrs Elif Kutlus Turkey & Caicos Oreopoloulos Greece. He also noted the presence of Daryl McGuire MP representing Minister for Veteran Affairs, Craig Laundy MP Reid, Jodie McKay MP Strathfield, John Sidoti MP Drummoyne & the Catafalque Party from 29th Operational Support Battalion Mounts. 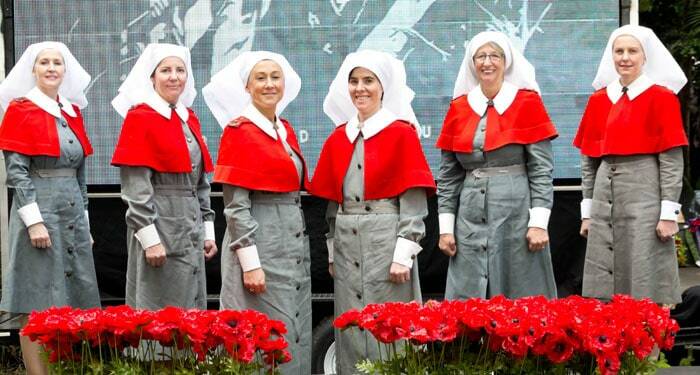 A highlight of the service was a screening of the changing nature & reflections of military medical techniques over the years along with a dressage of patient & nursing used in WW11. Finally it was noted that Anzac Day 2016 marks the centenary of the Battle of Fromelles, when over 5,500 Australians became casualties, 2000 were killed & 400 captured. Australia’s greatest war loss in one day. Professor, The Honorable Dame Marie Bashir, Distinguished guests, ladies and gentlemen. It is always an honor to be here at the Kokoda Track Memorial Walkway at this time of the year as we pay our respects and remember those who have sacrificed so much for us to have what we cherish today. When I learnt that the topic was Military Medicine – Fighting to Save lives, I thought to myself that there was a challenge as so often speeches are about the men (and women) who served on so many war fronts and what they achieved and sacrificed, that this would be something different. It is true that for centuries and through many wars, people have been trying to kill leach other which means that there has to have been those not fighting in the war but fighting to save the lives of the casualties of that war. In researching this topic, it got me thinking as to how to shape this speech and so I asked myself how did we get to where we are today and what we know in the treatment of battle wounds and how have we progressed into the 21 Century? It confirmed for me that history is a wonderful teacher. If we look at Military Medicine we have to understand that it encompasses not only Doctor’s, Nurses, Medics, but also other health professionals. However for the purpose of today, I will talk about the Doctors, nurses and medics as they are the forerunners to that emergency treatment and to the on going care given to our soldiers. I looked at who delivers that care from Point of Injury on the battlefield to ensure that the best success for the saving of life and limb is given and of course it is the medic. But where did the medics evolve from? If we go back to the ancient armies, many of them tried to reduce morbidity on the battlefield through the provision of first aid, with the object of this aid being to prevent further injury and relieve pain until medical help arrived. Sound familiar? The most successful were the Romans, under Emperor Augustus (63BC-18AD) who developed advanced military medical services to support their legions. These men, who wore the same combat gear as their fellow soldiers, were essentially combat medics, effective in providing prompt first aid due to their position in battle. Thus the origin of the military combat medics, known today as medical technicians, began. But it did not end there. These medics had additional training in the art of medicine and were exempt from other duties as their priority was the care of the wounded and sick both on the march and in temporary hospitals. The tradition stands true today with the military combat medic going into battle alongside soldiers of their company aiming to stabilise their injuries, give comfort and evacuate. It has been documented that the availability of persons skilled in the treatment of wounds improves the morale of fighting men, giving rise to a more efficient and motivated fighting force, and that is where the tradition of the military medic begins and continues on today. If we look briefly at our Medical officers beginnings, I found that Medical treatment for battle injuries is as old as warfare itself. The Greek Physician Hippocrates for who we all know the Doctor’s Hippocratic Oath is named, advised his disciples “He who should become a surgeon, let him join an army and follow it”. Modern military medical practice owes much to Napoleon Bonaparte’s chief surgeon, Dominique Jean Larrey whose greatest contribution was the flying ambulance – a horse drawn wagon that evacuated wounded from the battle field, so that they could be tended to further behind the lines. His use of triage – treating the wounded according to the severity of their injuries instead of by rank, was considered quite radical at the time. Today it is standard operating procedure however we have gone from horse drawn ambulances, to road worthy vehicles and air support in the shape of Aero Medical Evacuation (AME). Dr Larrey was also a proponent of immediately amputating a damaged limb rather than waiting until it became gangrenous. Military medical care followed the same pattern for more than a century. However, not to be forgotten in all of this is Queen Isabella, who is credited with the creation of field hospitals. It was during the re-conquest of Spain from Muslim rule in the 1480s that she provided medical tents for her wounded soldiers. The use of military hospitals and even mobile field hospitals caught on slowly. The English for example did not establish field hospitals until King William the III’s bloody trek through Ireland in 1690. Medical treatment & support comes not only from our own but can and does come from the unexpected. 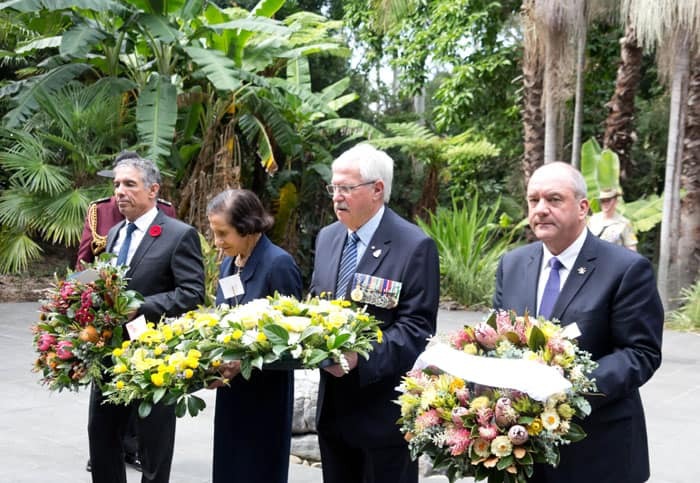 I think it is relevant to mention the support we received from the Fuzzy Wuzzy Angels who during the 1942 Japanese invasion of Papua New Guinea assisted and escorted our wounded troops down the Kokoda Trail. If it were not for the compassion these men had for our soldiers, then more than the 650 Australians who lost there lives, the number may have been higher. They had no specific medical knowledge but were saviours through their resilience continually carrying supplies and building tracks, bridges and huts. They are to this day remembered for what they did. 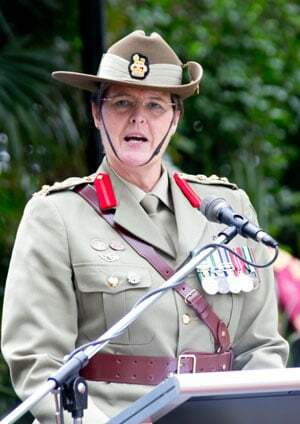 As we are now 16 years into the 21st Century, it was interesting to have a look back to the origins of the Australian Defence Force health services 100 years ago, which forms our Military Medical Services today, the changes in Defence healthcare in the intervening years, and where we expect to go into the future. The fundamentals of conflicts and wars themselves have changed – from the set piece battles and trench warfare of the Great War to the highly mobile conflicts of the 21st century. The establishment of the No. 1 Australian General Hospital (No. 1 AGH) is a case in point. First sanctioned by the Commonwealth Defence Department in August 1914, the unit left Australia as a General Hospital of 520 beds on board the S.S. Kyarra on 21 November 1914. Arriving in Egypt on 14 January 1915, the No.1 AGH was set up in the Heliopolis Palace Hotel. By June 1915, this 520 bed hospital and surrounding buildings held nearly 2500 patients, cared for by only 150 nurses. Needless to say, hospital equipment and supplies were totally inadequate. The sheer scale is daunting and, arguably, way beyond the worst nightmares of today’s Defence health planners. The resilience of the medical, nursing and health support staff, the innovation in difficult situations and the dedication to support the broader military forces continues on to this day. The ADF today has a variety of high quality health facilities, both deployable and non deployable. We have air transportable hospitals, which have shown their versatility in both the Operational space and the Humanitarian space. We have two Amphibious Assault Ships, the Canberra and the Adelaide where the amphibious training platform for our health personnel and fighting force, is ongoing. HMAS Adelaide and Canberra each have a Primary Casualty Reception Facility (PCRF) which is comprised of a Resuscitation and Triage area, two operating theatres, x-ray and pathology capability, an eight-bed Intensive Care Unit, and a 20 bed Low/Medium Dependency Unit. The PCRF is only activated when additional health support is required, such as recently during Operation Fiji Assist. When it is activated, Navy and Army medical staff are deployed. On occasions, RAAF personnel are used for their AME experience. The concept of the PCRF is that personnel who are wounded or ill ashore can be brought back to the ship via either a smaller Landing Craft or, more commonly, a helicopter. Patients can be resuscitated and treated on board and retained until they are stable enough to be returned to Australia or to a higher level of care ashore. In short – the PCRF is a damage-control surgical unit. It is not meant to care for inpatients for lengthy periods of time. However, the biggest player in our on going training and delivery of health care is that of Simulation. While Simulation provides a good mechanism to improve the reliability in training and especially to improve drills and team interaction, nothing beats real life. Medical Simulation in training is accepted practice in many areas of health and it has been demonstrated that group behaviour and improvement occurs with training. Military medical personnel have very little opportunity during peace time to practice battlefield trauma care skills; however our health personnel do undertake placements in civilian practices and hospitals and with the emergency ambulance services to gain exposure to a wide range of casualty presentations in situations that are as approximate to military operational conditions as we can achieve in peacetime. While there are no bombs and the environment is more controlled, the uncontrolled nature of real casualties in the emergency department or by the roadside, still stands out. Simulation can provide a risk free simulated learning environment where medical teams train across a range of medical procedures including trauma surgery. The military medical team as I said before is made up of the Medical Officer, Nursing officer and medics and as a team they provide that high end treatment and this can be attested to when you look at our survivability rate in current operations. Our Medical Officers and Nursing Officers come with specialist skills and experience as in Intensive Care, Peri Operative and Emergency. Our Medical Officers, have exposure to high end training such as the Emergency Medicine Severe Trauma course which nurses can also participate in as well as the Emergency Medicine Severe Burns. Medical officers can also specialise in Orthopaedics, General Surgery, Intensive Care Specialist, and Emergency medicine with a focus on trauma, to name a few. Our medics are trained to a level to operate as a Patrol Medics where they need to have the skills, and knowledge as well as the confidence to be the ‘medic on the ground’ and more often than not, by himself or herself, to provide that emergency treatment to more often than not, more than one casualty. Their skills are more advanced than the medic who functions within that resuscitation team based on their differing roles. What we now know, is a product of being at war for 14 years. The management of the injured on the battlefield with the use of tourniquets, the system that is used to evacuate wounded from the battlefield, the way we resuscitate patients, the types of surgery that is performed, the whole philosophy of what we do is Damage Control Surgery. It is the rate of those improvements that have been made into the 21st Century that has reduced the number of preventable deaths on the battlefield by 200%. We are where we are based on more than a decade of experience and our training has been structured to best prepare our health people to go on operations with knowledge of to what to expect. Their training continues whilst deployed. The medical advancements in War are positive ones. To quote the Assistant Secretary of State Dr Johnathon Woodson of the Defence Health Agency, “if war is the dark side of humanity, then military medicine is the light” From the IRAQ and Afghanistan wars, I have chosen a few advances in Medical Technology that definitely brings us into the 21st Century. Tourniquets: This is not new, but definitely improved. Death on the battlefield is often attributed to great blood loss, so from the humble tourniquet used for many years, this has been replaced by the Combat Application Tourniquet. In an age where IEDs are a favored weapon of insurgents, the Combat Application Tourniquet has proved singularly effective. Every Australian soldier goes through refresher first aid training before they arrive in a conflict zone such as Iraq or Afghanistan, and much of the time is spent on how to use the tourniquet. Every soldier carries one strapped to the front of their body armor vest. Battlefield Dressings: now have a clotting ability which reduces blood loss by 50 -80% increasing survivability. Blood refrigeration: This is a capability enhancement of the current blood supply, transport, and storage and preparation arrangements available to the ADF in the deployed environment. This capability seeks to deliver the materiel elements for the transport, storage and re constitution of deep frozen blood and blood products in the deployable environment in the Maritime, Land and Aerospace domains. This capability will be deployed in the latter half of 2017. Pain Management: Nerve blocks used to affected areas for patients requiring surgery. No anesthesia and again not new but drastically improved. Prosthetics: An area where Australia is coming into its own from which our soldiers have benefited and will continue to benefit as technology improves. We have had three of our soldiers to date, implanted with titanium legs so that robotic legs can be fitted. We have also benefitted from the Center for the Intrepid at Sam Fort Houston Texas, a world-class rehabilitation facility which has in-house prosthetic engineers who design and make everything from carbon fiber legs to robotic arms. This allows theirs and our soldiers to continue serving and deploying. Identifying and treating Traumatic Brain Injury: The utilization of hyperbaric oxygen therapy increases the amount of red blood cells and body tissue absorption which in theory changes the way the body heals. Simulation Centres: The Sydney Simulation Centre is used by our Doctors, Nurses and Medics. The facility covers Cardiac/Trauma Room for scenario training, Procedural labs, Mobile simulation, surgical skills training lab, recording and debriefing for training purposes to name a few. All state of the art for the ongoing education and maintenance of clinical skills where civilian opportunities are limited. We have the best health practitioners, with the best training opportunities using best practice in the ADF. We have the means to continue training when civilian opportunities are not available. We have the use of state of the art Simulation which exposes the Doctors, Nurses and medics to real time trauma casualties, which they are likely to be exposed to on operations and which best prepares them for the unexpected. Our training is ongoing and as new practices, new technologies and new equipment become available and is relevant to us doing our job, we procure it and utilise it to continually improve what the Defence Force has invested in – health capability. Before I close, I would like to mention the passing on 29 February of Meg Ewart, 101 years old and who was present at the bombing of Darwin, who also deployed to Papua New Guinea before coming back home to work here at Concord. One of our Vietnam Nurses, Diane Badcock who had been battling ill health for many months, passed away peacefully on 24 March aged 71, and Faole Bokoi the last of the Fuzzy Wuzzy Angels who passed away 7 March.